To celebrate the recent anniversay of the first Blandings novel, I visited the charming town of Chichester to see a new stage musical adaptation of P.G. Wodehouse’s A Damsel in Distress. This story first appeared as a serial in the ‘Saturday Evening Post’ in 1919, and was published in book form later the same year. During Wodehouse’s lifetime it was adapted as a silent film, a stage-play (by Wodehouse and Ian Hay), and as a 1937 musical starring Fred Astaire with music from George and Ira Gershwin. Wodehouse’s own career in the theatre spanned some thirty years. He wrote several plays and was a theatre critic for Vanity Fair. His main contribution, however, was as a Broadway lyricist working in collaboration with Jerome Kern and Guy Bolton. The theatre world features frequently and is affectionately portrayed in his stories, including A Damsel in Distress. 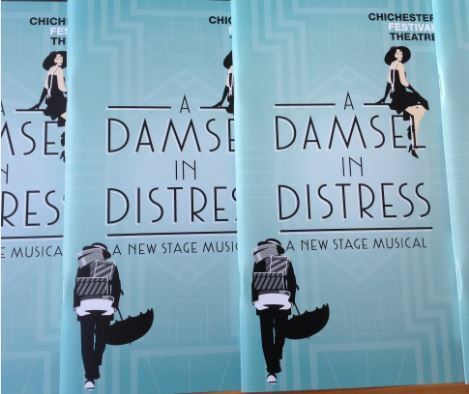 Wodehouse belonged to the stage as well as the page, so when I learned that a new stage musical of A Damsel in Distress was being performed at the Chichester Festival Theatre, I wasted no time in dashing off to Sussex to catch the final performance on June 27th. And boy am I glad I did! The show has finished it’s run in Chichester, but you can still watch the rehearsal trailer. The story of my visit to Chichester and a glowing review of the show follows below. The first treat on my visit to Chichester occurred on route. The journey by train from my home in Somerset to Chichester requires roughly three hours, and about a dozen changes, but redeems itself by passing through Wodehouse’s former home town of Emsworth. 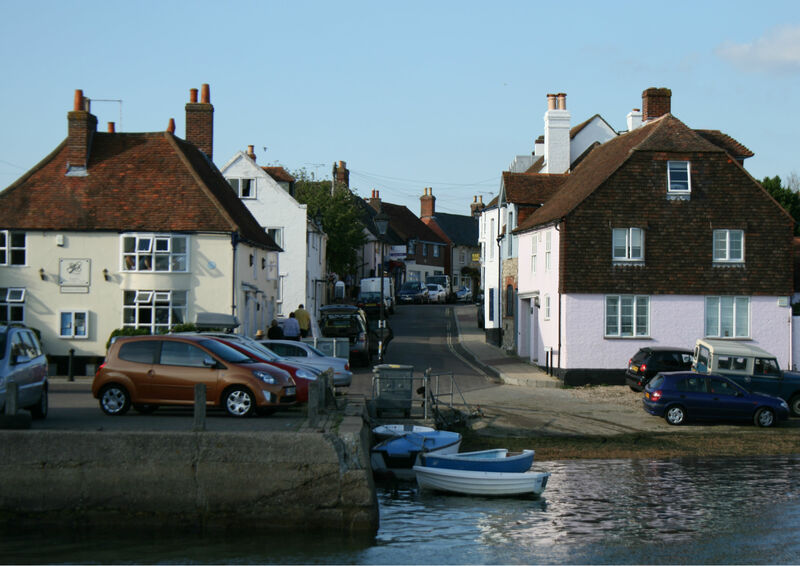 As N.T.P Murphy confirms in The P G Wodehouse Miscellany (2015), Emsworth is the ‘real’ location of Belpher village, where A Damsel in Distress is set. For anyone who has visited this former oyster fishing town (as I did in 2013) Wodehouse’s depiction of Belpher is clearly the same place. For years Belpher oysters had been the mainstay of gay supper parties at the Savoy, the Carlton and Romano’s. Dukes doted on them; chorus girls wept if they were not on the bill of fare. And then, in an evil hour, somebody discovered that what made the Belpher oyster so particularly plump and succulent was the fact that it breakfasted, lunched and dined almost entirely on the local sewage. There is but a thin line ever between popular homage and and execration. We see it in the case of politicians, generals and prize-fighters; and oysters are no exception to the rule. There was a typhoid scare — quite a passing and unjustified scare, but strong enough to do its deadly work; and almost overnight Belpher passed from a place of flourishing industry to the sleepy by-the-world-forgotten spot which it was when George Bevan discovered it. The shallow water is still there; the mud is still there; even the oyster-beds are still there; but not the oysters nor the little world of activity which had sprung up around them. Its proximity to Emsworth makes nearby Chichester a fitting place to stage this musical revival of A Damsel in Distress. It is also close to Goodwood Racecourse, where many Wodehouse characters (notably Bingo Little) have lost their shirts. Chichester itself is an attractive, prosperous looking town, with an attractive, prosperous looking populace and an air of genteel distinction. As someone who is neither attractive nor prosperous, I never felt more of a blot on the landscape in my life, as I waddled along Chichester’s main street. Even the town’s elderly inhabitants — women old enough to have earned the right to elasticated waists and comfortable shoes — could be seen teetering precariously under half-a-ton of jewellery, on heels that would give me vertigo. The good ladies of Chichester do not let themselves go – they cling on. Inspecting myself critically in shop-windows, I felt increasingly like a worm who has gotten above itself and crawled into Princess Charlotte’s salade nicoise. So I popped into a local “outfitters to the gentry” in the faint hope that it’s never too late to start making an effort. I don’t know what I expected to find — some tasteful trousers or a tweed skirt. What I got was a shock. It seems the gentry and I are discrepant on matters of taste as well as oofiness. Whereas my inclination is to cover the baggage with cloth, the modern Lady seems to prefer the sort of costume that looks as if it’s been designed by the Gynecological Society to allow curbside examinations. Leaving empty-handed, I proceeded to the Chichester Festival Theatre in a slightly nervous state (overtaking several septuagenarians in stilettos on the way), but my first sight of the theatre put me at ease. Of a stylish 1960s design and situated opposite an expansive lawn, it reminded me of the Adelaide Festival Theatre, where I saw my first performances as a child and was later married in the rotunda on the lawn. The day was warm (in Chichester, not Adelaide) and the doors had been thrown open, bringing a refreshing breeze indoors. 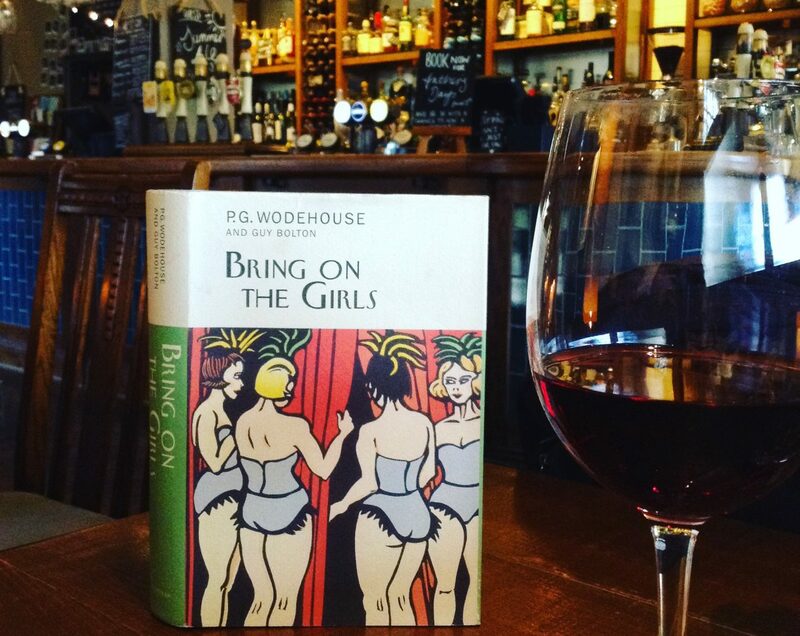 It was the sort of day Wodehouse himself might have written about, and I quickly felt at home among the throng of theatre-goers, beaming in happy anticipation. A Damsel in Distress did not disappoint. From the moment the chorus tapped out the opening number — Things Are Looking Up! — I knew I was in the presence of something special. I believe Rob Ashford, the show’s American director and choreographer is some sort of big-wig in the business — and by golly he oughta be! It’s difficult to imagine how this adaptation could have been more perfect. This adaptation compares favourably to both the original novel and the Astaire musical. George Bevan (played by Richard Fleeshman) is an American composer overseeing the introduction his latest Broadway hit to the London stage. He falls in love with Lady Maud Marshmoreton (Summer Strallen), whose family mistake him for the man she loves. They want her to marry Reggie Byng (Richard Dempsey), who in turn loves Alice Keggs (Melle Stewart), who is Lord Marshmoreton’s secretary and a niece of Keggs of the Butler. Meanwhile George’s friend in the chorus, Billy Dore (Sally Ann Triplett), mistakes Lord Marshmoreton (the wonderful Nicholas Farrell) for a gardener, and captures his heart. The unpleasantness of class snobbery pervades the piece — as it does throughout Wodehouse’s work. I am always bewildered by the popular misconception of Wodehouse as a preserver of class distinction, when his plots repeatedly smash both class and trans-Atlantic cultural barriers. In A Damsel in Distress, class snobbery is embodied in character of Lady Caroline Byng (Maud’s Aunt and Reggie’s step-mother). She wants them to marry, and strongly objects to George Bevan — as a member of the lower-classes, an American, and presumably poor — as a suitor. In the original book Aunt Caroline is supported by Maud’s brother, the repulsive Lord Belpher. In this adaptation she is the lone representative of class snobbery, wonderfully played by Isla Blair who is everything a stage Aunt and comedy villain ought to be. This musical doesn’t skimp on matters below stairs either. Lead by Keggs the butler (Desmond Barrit), french chef Pierre (David Roberts) and Dorcas the undercook (Chloe Hart), the staff at Belpher castle plot to undermine Lady Caroline and support the amiable Lord Marshmoreton’s efforts to assert himself as head of the family. Their big song and dance number in the kitchen — Stiff Upper Lip steals the show — I’ve never heard this song sound so good. My daughter and I sang it all the way back to the station, and are still humming the tune a week later. The entire cast and orchestra were superb. Richard Fleeshman was the perfect leading man as George Bevan, with matinee idol looks and a voice that makes you want to close your eyes and drink through your ears. Sally Ann Triplett sparkled as Billie Dore, who is the more appealing heroine in Wodehouse’s original book also. Lady Maud is one of Wodehouse’s least endearing heroines. As the distant maiden in castle — the damsel in distress of the title — George mostly admires her from a distance, whereas we encounter her close-up. The shallowness of her character (especially in the final scenes of the book) is uncomfortably clear, although the reader is content to feel George’s pleasure when she agrees to marry him. Summer Strallen makes Maud as appealing as she can, and sings beautifully. The one jarring moment for me came when Reggie Byng made his first appearance in a flurry of ‘What Ho’s, ‘I Say!’s and ‘Tootle Pip!’s — looking and sounding like the sort of blithering idiot Wodehouse is famous for. Indeed for millions of people, creating upper-class twits is all Wodehouse is famous for. It seems no modern adaptation of his work can do without one. I’m not suggesting Reggie ought to have entered solemnly, quoting Proust, but I find the overplayed English twit caricature tiresome. I’m clearly in a minority as Reggie’s appearance at Chichester was a notable hit with the audience. Eventually I too was won over by Richard Dempsey in the role. His rendition of ‘I’m a poached egg without a piece of toast’ would melt the sternest critic’s heart. That’s the power of great musical comedy, and Wodehouse. They can transport us momentarily from our woes, and even our prejudices, to a state of carefree joy — something the multi-million dollar popular psychology business is still working at. They may be dismissed as ‘light entertainment’ by an overprivileged few, who perhaps have fewer woes to escape than the rest of us, but if you’re an out-of-place worm in the nicoise of life, the benefits are well worth the price of admission. I haven’t said nearly enough about the show — the impressive sets, the costumes, the wonderful quality of the music, dancing and choreography (Pierre and Dorcas were a treat). Nor the pleasure of seeing Nicholas Farrell, who I’ve long admired since he appeared in my favourite television show (Drop the Dead Donkey). I could say so much more, but if I’m to post this review in the same decade in which I saw the bally thing, I really must draw the line somewhere. If A Damsel in Distress plays anywhere near you, be sure to catch it! Good and an in depth review. Sort of drives the reader into the musical! Thank you so much. I enjoyed reimagining it too. “He even married into the chorus.” Robert McCrum made this up and it is not true. You can quote me. It’s surmise presented as fact, a fatal flaw throughout that book. Well there you go. I too believed It. She was involved in theatre though, wasn’t she? The latest P.G. Wodehouse Miscellany by Norman Murphy mentions the she was part of a touring repertory company. I apologize for that, Ms. P. I’m just on a soapbox about that. I enjoyed your review and admire your writing! Thanks. No apologies required. I am really fascinated that new information has been uncovered. Will this be in your upcoming book, John? That’s dubiously based on a ship’s record that isn’t proven to be relevant to Ethel. Someone else entirely, in fact. It was another McCrum guess, and not a very good one. Msg me if you want to see the full details, including the story of the real Ethel Walker. I have a first edition of the McCrum book and always considered it, as I believe it was considered at the time, pretty definitive. So I’m intrigued by your assertion as to ‘surmise presented as fact’ throughout the book. Could you tell us more on this?? What are other people’s views on the McCrum biography? – I’d be interested to know. I believe John is best posed to respond to this — I don’t wish to take credit for his original ideas or research. One point John has raised previously is the tendency of Wodehouse’s biographers to linger on Wodehouse’s childhood and boarding school experiences, and draw conclusions about the adverse psychological impact on his character. But Wodehouse describes his childhood as happy, and he lived a fairly well-adjusted sort of life. John has questioned the biographers’ conclusions quite convincingly in the past. I know he is doing some original research, so it will be interesting to see what he has uncovered. But for now, we rely on established sources like the McCrum bio, other researchers like Norman Murphy, and the society websites. I thought my comment had gone to John – sorry, me being a techno-idiot again. I did click on the ‘reply’ next to his name. No, you haven’t done anything wrong. I just saw your comment and thought Id chip in. Promote away, old Bean. This is good stuff and while I thoroughly enjoyed reading it, and hope the show comes to my part of mid-America, I would make one slight quibble. I think you under-sold Plum’s theatre career time. I believe he was actively involved in theatrical productions from about 1905, in London with Seymour Hicks, until well into the 1950’s, if not even the 1960’s, as he and Guy Bolton plotted, in several senses, their return to prominence in companionable visits while in Remsenburg on Long Island. It has nothing to do with the show under review but one hates to see Wodehouse deprived of all the credit he is due. Glad you enjoyed it. Thanks for the correction on the theatre career. I wouldn’t put it past Wodehouse to have notes for some play or lyrics right to the end of his life. In The Theatre of P.G. 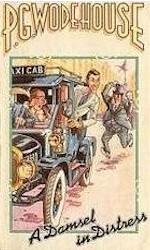 Wodehouse, David A. Jasen, cites the first production Plum was involved with as Sergeant Brue in 1904 (writing a lyric) and the last as Don’t Listen Ladies – a 1948 play, which is well over 40 years. I should have dug this book out when writing the piece. One thing I have just discovered, looking at the section on the 1928 production of A Damsel in Distress is that Joan Hickson — who was so wonderful as Miss Marple — appeared in the part of Miss Mould. It would have been wonderful to see these shows Victoria. Oh dear, this one was meant to go to Ninepennyworth. I’m sure I’ll get the hang of this eventually. I think you did the right thing. I just threw in a comment. Aha! How does that work then?? Your reply to the person who made the comment shows on the thread of discussion on the page. Of course it does. I really shouldn’t blog when I’m tired! Ah! Honoria outs herself as an Adelaide girl, or at least someone who was at home in the place. It’s still fairly dull. I’m with you, Honoria, on Wodehouse’s use of class consciousness. Although the man himself claimed he never wrote a serious word in his life, for those who would see, he most clearly did. Waugh and Powell satirised the upper classes but Wodehouse did it first — the difference being that he was mostly gently ribbing, while they could be, and often were, vicious. As for Ethel’s place in the chorus, I’d bow to Dawson, although I could have sworn I read the same thing Jasen and Donaldson. What Ho Noel. Yes, I’m an Adelaide girl. I grew up there in the Dunstan era, when the Festival Theatre was built. I was never fond of the place, although my appreciation for it (and friends left behind) has grown since I’ve left. I never met a Wodehouse fan there though. I ‘found’ Wodehouse when I was living in Darwin. Now that’s a story! I am so glad you feel the same way about Wodehouse. I am always fighting back the temptation to make some serious points about his writing. Sometimes not fighting very hard, I admit. I know it crosses a line for many Wodehouse fans, but (perhaps it’s the Australian in me) I find his egalitarianism so appealing. John Dawson is quite probably correct, I agree. He has been researching a new book, which will be released later this year. What a delightful review! Hoping I get the opportunity to see the show sometime. Thanks Paul. I hope so too. A cracker of a review at every level, wish I had seen it. I recently discovered that so much of the lyrics for music my family played ( on the old vinyl records ) were by P.G. I can’t believe how prolific he was.